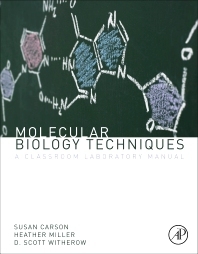 This manual is an indispensable tool for introducing advanced undergraduates and beginning graduate students to the techniques of recombinant DNA technology, or gene cloning and expression. The techniques used in basic research and biotechnology laboratories are covered in detail. Students gain hands-on experience from start to finish in subcloning a gene into an expression vector, through purification of the recombinant protein. The third edition has been completely re-written, with new laboratory exercises and all new illustrations and text, designed for a typical 15-week semester, rather than a 4-week intensive course. The “project” approach to experiments was maintained: students still follow a cloning project through to completion, culminating in the purification of recombinant protein. It takes advantage of the enhanced green fluorescent protein - students can actually visualize positive clones following IPTG induction.